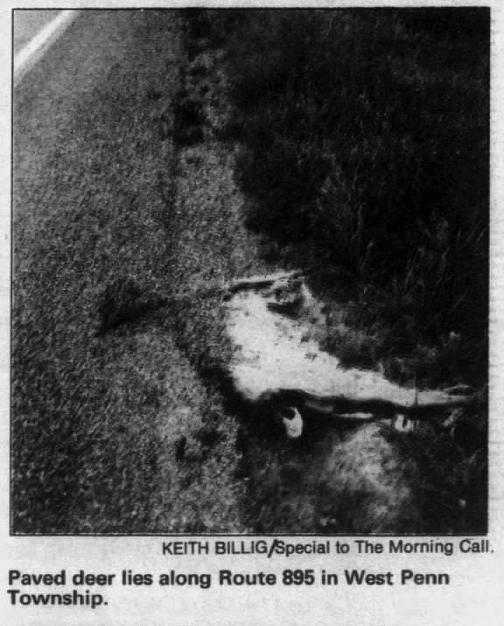 I've heard of road-line painting crews not bothering to move roadkill out of the way. 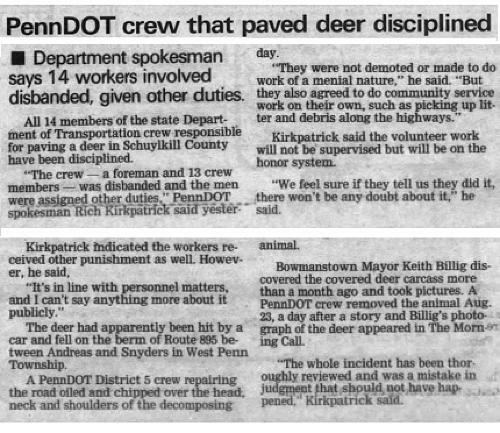 But I hadn't heard before of a paving crew simply paving over a dead animal instead of moving it. 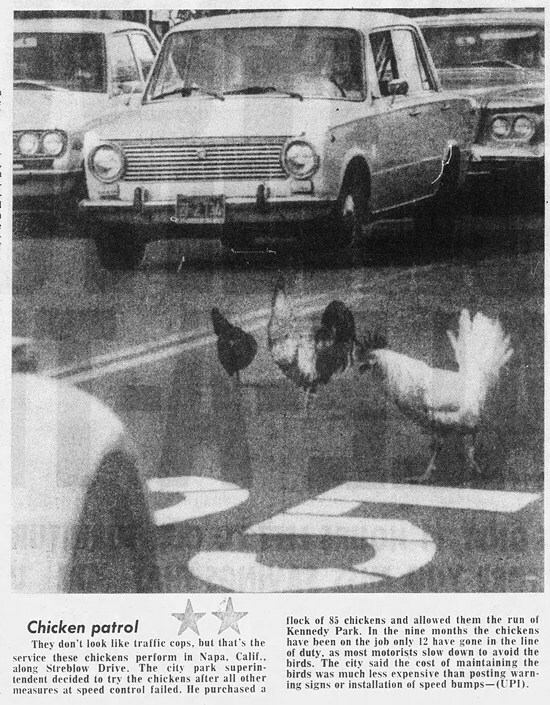 1975: Rather than installing expensive signs or speed bumps, Napa, California experimented with using chickens to slow down motorists on one of its streets — Streblow Drive, bordering Kennedy Park. They simply let 85 chickens roam the park and street at will. Said park superintendent Bob Pelusi, "Only occasionally does an errant driver charge through the flock. 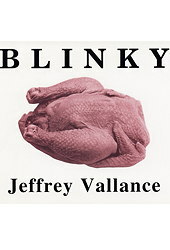 In the nine months we've had the chickens on the job, we've lost 12 of them — gone in the line of duty, so to speak." Havana, Illinois has a bug problem. 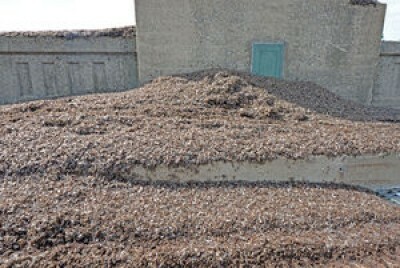 Not bed bugs or cockroaches, mayflies. Their bridge is covered in them and by covered I mean up to six inches deep. The resulting bug goo all over the bridge has caused a number of accidents, cars and motorcycles. A certain kind of water bug grows wings and swarms as mayflies before laying eggs. I am thinking there will be far fewer of the water bugs this season because so many got squished on the bridge before laying eggs. 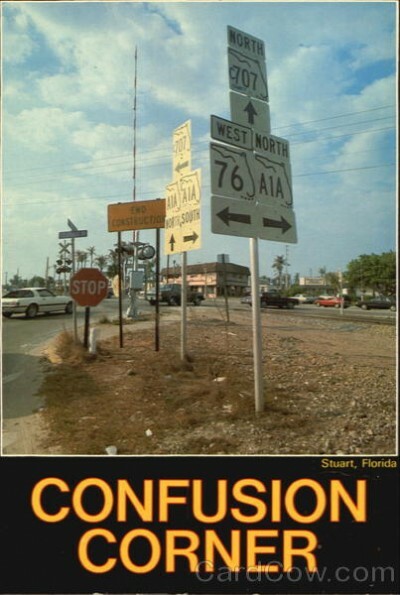 A traffic roundabout so jumbled, it earned fame and its own postcard.